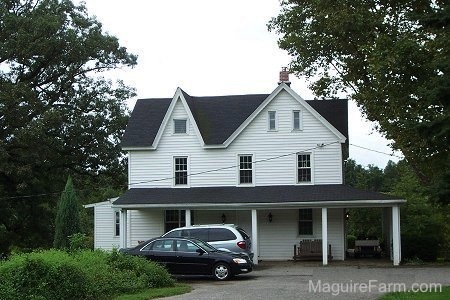 The Maguire Farm dates back to the 1800's. There were a couple of additions added onto the house in the 1950's and 1960's. Luckily, because the house is so old, it has limited fiberglass insulation installed. Most houses have it behind every exterior wall, under floors and in the basement, garage and various other places. 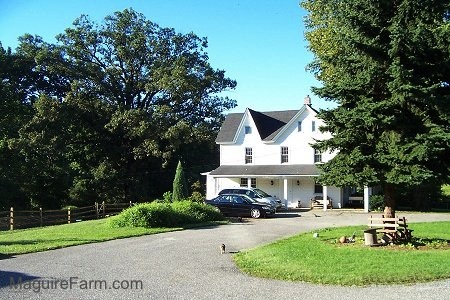 This old farmhouse only has it in the additions that were added later located on this side of the house. It is in both bathrooms, in the dining room, one upstairs bedroom and between the third floor and second floor ceiling and in the basement. We are going to work on removing all of it. It's not easy to get rid of it as it is behind the walls, but fiberglass only lasts so long before it starts to break down and become airborne and it is already causing health issues. Left, the springhouse, house in the background. The springhouse is shaded by a very large white oak tree.